On the side here you can see a picture of the edition of the 1948 (Houghton Mifflin Company) edition of The Gathering Storm which I own. (Only this is not a picture of MY book because I would never lay mine out flat and ruin the spine like that!) 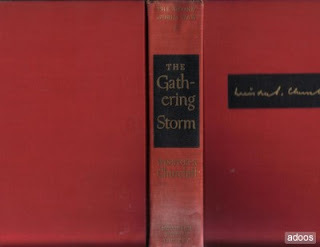 The Gathering Storm is part of Winston Churchill's series on World War II. It is the first book in the series, all of which I intend to read. Whenever you mention the word "history" people's eyes tend to glaze over and they overlook the most fascinating stories as a result. History might tend to make people bored because it is frequently presented in dull fashion. Dry facts produce snores. I'll grant you that. Books like Unbroken (linked to my review) offer the student of history so much more because it brings the past to life through someone's personal story. Such is the case with Winston Churchill. This series takes a look at the history of World War II as it played out before Winston Churchill's eyes. He doesn't even try to be impartial. These books are his take on a remarkable period in world history and it's made even more remarkable when it is told to you through the pen of a passionate man. Discovered that Churchill really does not have much patience with America. We apparently drag our feet too much when it comes to the problems of the world. I wonder if he'd approve of America's desire to involve herself in every little infraction all over the globe these days? Did he really wish for us to be everywhere? Day 2: Read Chapters 4-5. Found Chapter 4, Adolf Hitler, quite fascinating. He gives us a history of Adolph Hitler's life and experiences post World War I which help to explain the man Hitler became. I knew most of the information about Hitler which Churchill shared but was greatly entertained by Churchill's description of the "lonely.....little soldier." Makes you feel like Churchill was patting Hitler on the head or something. Equally amusing was Churchill's recitation of his visit to Germany wherein he almost met Hitler. I had heard of this chance meeting (which ultimately did not happen) but did not know the history of why the meeting failed to take place. Apparently Churchill had questioned Hitler's passionate dislike of the Jews and when this was communicated to Hitler, he declined to meet with Churchill after all. Churchill's opinion of America immediately in the early 1930's? Day 3: Chapters 6-10. Focused on disarming of France, specifically, and other nations generally while the Germans secretly (and sometimes not to secretly) rearmed themselves. "The awful danger of our present foreign policy is that we go on perpetually asking the French to weaken themselves. . . . I cannot imagine a more dangerous policy. There is something to be said for isolation; there is something to be said for alliances. But there is nothing to be said for weakening the Power on the Continent with whom you would be in alliance, and then involving yourself more [deeply] in Continental tangles in order to make it up to them. In that way you have neither the one thing nor the other; you have the worst of both worlds. Churchill meets with a great deal of unpopularity in constantly criticizing the government for not doing more to prepare for the war which he predicts and foresees as being an absolute fact. "Stanley Baldwin was the wiser, more comprehending personality, but without detailed executive capacity. . . . He knew little of Europe, and disliked what he knew. Neville Chamberlain, on the other hand, was alert, business-like, opinionated, and self-confident in a very high degree. Unlike Baldwin, he conceived himself able to comprehend the whole field of Europe, and indeed the world. Churchill mentions, in the context of 1937, that he was twice invited to meet with Hitler. Churchill thought the better of meeting with Hitler at that time though, as he recognized that he did not have the authority of Britain behind him and didn't want to compromise himself, politically speaking, by agreeing to an audience with a man he didn't trust. I think keeping a diary for longer books is a good idea. Sometimes I get to the end of a book, but when I look back at the beginning I realize I've already forgotten some of it. You are right! It's such a shame we young folks (yes, you too...although I don't think you and I actually have this problem) disregard history or just people who have come before us. That's why I studied history in college. I think it's dangerous when we don't know the people who built our world and formed our ideas. I cracked up when you said, "this is not a picture of my book because I would never lay mine out flat," because the minute I saw the picture I thought. WHY WOULD SHE DO THAT TO HER BOOK!?! Glad you clarified. hahaha! HUGE grin about you being equally horrified about the spine of that poor, defenseless book!!! It's HORRENDOUS! Excellent diary excerpt, Carrie. I look forward to the ones to come. 1. There is no such thing as unbiased history. There is no such thing as unbiased journalism. There is plenty that masquerades as unbiased in both fields. I believe it is better to acknowledge one's biases up front rather than pretend they don't exist. 2. Young people cling to absurd and dangerous ideas when they sense that the "old folks" are clinging to hollow and untrue values. I believe we are seeing this in our time. Nazism triumphed during a period of economic distress and following a period of philosophical emptiness. This is what I get for commenting and not checking back. Carrie: Now, here is my bias. I have an easier time reading history that is biased...if I agree with it. And knowing a teeny tiny bit about Churchhill, I probably do. So, I'm definitely adding it to my "to-read" list. Diary of an Autodidact: The statement "there is no such thing as unbiased history" is a bit of an axiom that no one really takes time to examine. You are correct in repeating it, but you have to go a bit deeper than that. Obviously because it is written by humans, you can't remove it's humanity. However, the difference between a Howard Zinn and a Eugene Genovese for example is palpable.